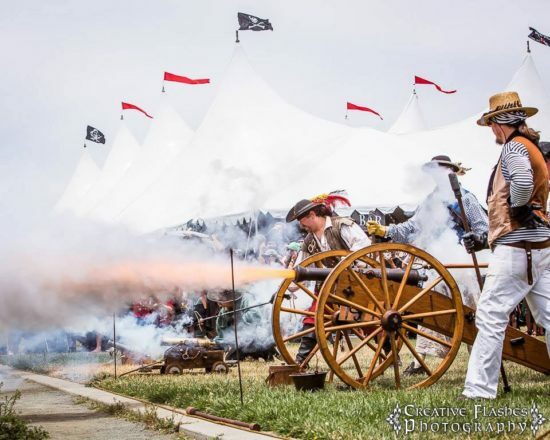 Embrace your inner buccaneer this Father’s Day Weekend and set sail for the biggest playground for all things pirate at the annual Northern California Pirate Festival in Vallejo’s Waterfront Park. It’s the largest pirate event in the United States. Schedule times subject to change. See schedule at Front gate and stages for most up to date information. Don your pirate garb and join over 500 costumed actors, crafters and musicians at this annual fest which is equal parts Mardi Gras, state fair, living history, and pegged-leg eye-patch-wearin’ fan fest that appeals to children and adults alike. With continuous entertainment, rows of nautically inspired handcrafts, gourmet foods, micro-brewed beers, and ship-to-shore canon battles, visitors will encounter proper British Naval Officers and alluring mythical mermaids.